The open data sharing platform that makes the air cargo industry less cloudy! BRUcloud is an open data sharing platform that enables the different stakeholders to work more “integrated” and act as a network. Applications are plugged-into the BRUcloud data sharing layer and create quick wins and efficiency gains for the involved stakeholders. 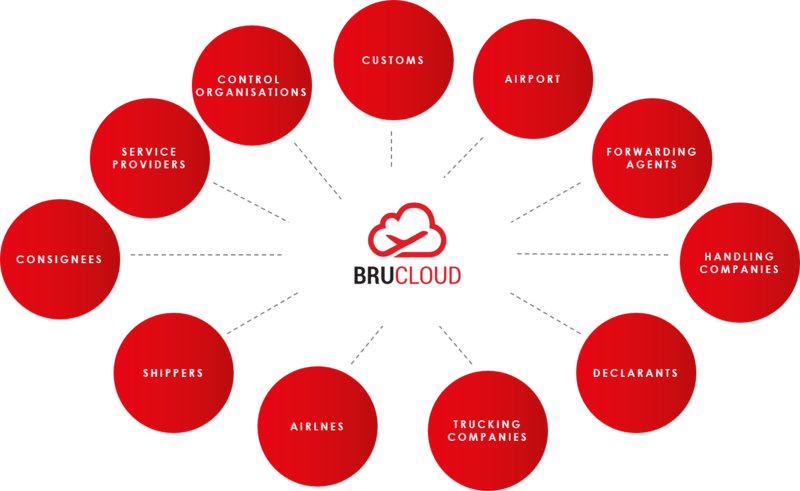 BRUcloud is an initiative of Brussels Airport, based on Nallian’s data sharing technology and supported by the BRUcargo community umbrella organization, AirCargoBelgium. BRUcloud was built thanks to the support of the Flemish Government and VOKA. To unlock the full potential of the BRUcloud, stimulate the growth of BRUcargo and make a more qualitative, paperless, transparent and efficient way of working possible, the following principles are always high on our agenda! Data sharing makes a “single source of truth” possible and can overcome the issues of data duplications. It creates huge advantages to have data available on demand, instead of relying on messages. It is important to know this can happen in a trustworthy environment. BRUcloud guarantees that the source stays in control of the data. He defines with whom and in which context data can be shared. Apps are developed to create efficiency gains and quality improvements for the participants on the BRUcloud. Different logistical app providers can make use of the ecosystem created by the BRUcloud, to easily have access to a critical mass of customers for their app. The more apps are available via the BRUcloud, the higher the operational value for all stakeholders. Increasing efficiency and smoothening the processes at BRUcargo is one thing, but we do realize in the end, the shipper and our end customer are looking for end-to-end quality and transparency. The BRUcloud concept and/or its individual apps can be implemented in other communities. Linking the BRUcloud with other community clouds is a priority on our roadmap. By making information exchange between communities reality, a full paper-less and highly efficient air cargo supply network becomes possible.